If you want to add a dash of vintage charm to your festive gift, the memorabilia offered by Park Hyatt seems just right. It comes in a classic old fashioned trunk and comprises macaroons, truffles and cookies, jams, preserves and pA?te de fruit, fruit-based jelly made in-house. a�?As a doff of the hat to Hyderabada��s Nizami heritage, we have included jasmine-scented candles. Also, there are handmade stoles and the Park Hyatt charm,a�? says Mohit Malhotra, F&B Director, Park Hyatt. If you are thinking of gifting your good old friend whoa�?s the ideal company for a drink or two, the Ambrosia hamper from Taj Banjara is an ideal fit. Comprising wine from Fratelli, Johnnie Walker Red Label, handmade chocolates, Danish cookies, nuts from Nut King, Opera Wafers, pasta, candle, diya, sparklers, Ganesh Idol and toran, this box of goodies signifies good times. Of all the gifting options offered by Taj Krishna, the Grand Cuvee Hamper is luxurious and exclusive to the hilt. From Dom PA�rignon champagne, bottle of single malt Glenfiddich-18 years, imported Kahlua, designer tie and cufflinks from Burberry, organic green tea, exotic chocolates and nuts, organic green tea, a Ganesha idol, this hamper sums up luxury. Does it get any better? If you are fussy about what goes in your gifts, the ones by Ishita Raksha at 17 Sugar Street allows you to customise. From an eclectic range of spiced nuts, cake truffles to mini cookie jars, the choices are umpteen. They can also include gifts according to specific requirements like perfumes, silverware and even have a say in the ingredients that goes into the making of the desserts. If a simple and basic hamper is what you are looking for, the one at Trident is tailor-made for you. 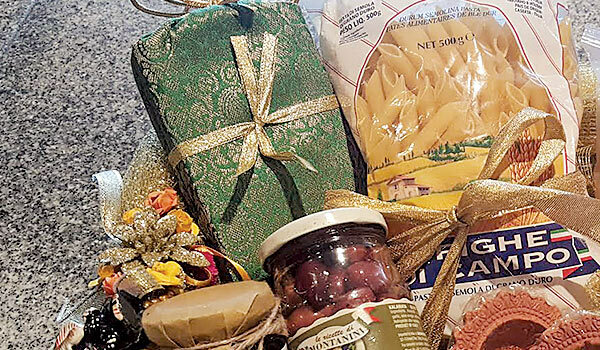 This one comes in a bright neon box with a mix of delectable fare including dry fruit, cake, cookies, specialty tea and a bottle of olives with organic honey nuts. The diya and metal Ganesha add to the charm of this gifting option. Amongst the bakeries, Concua��s gourmet hamper takes the cake. The one called Provence, inspired by that region of France, is well curated with chocolate coated nuts, lip smacking spreads in petite jars, delicious tea cakes, buttery cookies and French macaroons. For a mix of healthy and tasty treats, the Celebration Hamper (Grande) replete with dark chocolates, flavoured dry nuts, crunchy nachos, stuffed dates, Mexican salsa,collection of fine teas and coffees, cookies and biscotti all packed beautifully fits the bill for picky eaters.